Say good-bye to old fashioned crown making. No more gooey, messy nasty tasting impression material. No more wearing a plastic temporary crown. 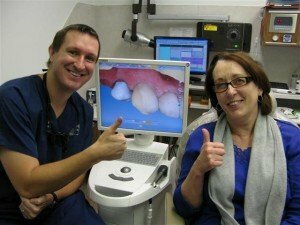 With advanced computer technology Pasadena, Texas Dentist Dr. Nugent can prepare, create and cement your crown in one dental visit. With CAD/CAM technology Dr. Nugent has complete control of the crowns shape, contour and color. Get the best in advance dental care.